On the website of the Archdiocese of Atlanta there is a section dedicated to their Office of Catholic Cemeteries. Having read that sentence you probably know where this article is going: headstone information. On the webpage you can find PDF documents of headstone transcriptions from five cemeteries: Budapest, near Bremen/Waco; Locust Grove, near Sharon; Purification, also near Sharon; Sparta; and St. Patrick's, near the town of Washington. Locust Grove, Purification, and St. Patrick cemeteries all contain burials of people born in Ireland. Where available, this information, including counties and parishes of origin, has been transcribed in the documents. You can view the webpage, and the transcriptions, here. In tomorrow's article, I will write in more detail about one such Irish Catholic community in Georgia, located in Locust Grove. Teaching was one of the professions that people with "a bit a' money or a bit a' brains" often gravitated to before university education opened up to the general population in Ireland. This tradition continued among Irish people who emigrated, with the growing public and Catholic school systems in various countries providing many employment opportunities. As a result, occupational records from schools, education administration bodies, and teaching organizations can be quite useful. One such example is the Teachers Petition Database on the New Brunswick Irish portal website. "Irish immigrants in New Brunswick taught in one-third of New Brunswick schools by the mid nineteenth century" and this lead to "teachers’ petitions from Irish immigrants requesting a license or payment for teaching services containing biographical information." "Names, country of birth, education, teaching experience, church affiliation, samples of handwriting and certificates from local school trustees or clergymen verifying the character and abilities of the petitioner" are often included. This database contains 509 records for the 1816–1858 where the teacher's country of birth is listed as Ireland. Click here to access the database. The website also has an article about the impact of the Irish in New Brunswick schools. Provincial Archives of New Brunswick. Teachers Petition Database. 2013. http://archives.gnb.ca/Irish/Databases/TeachersPetition/?culture=en-CA: accessed 26 November 2013. Provincial Archives of New Brunswick. 2013. 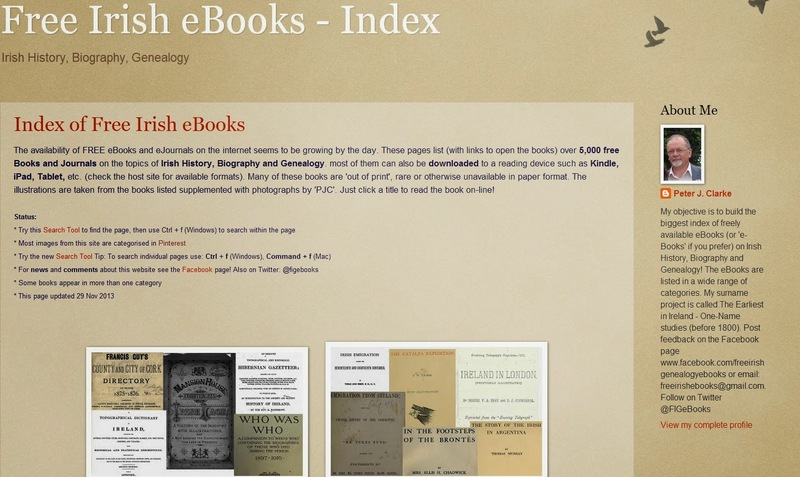 The explosion in the number of scanned books over the last few years has opened up a previously difficult to access resource for genealogists. Local, obscure, and very old publications are often only found at a small number of libraries and repositories, making it difficult for many researchers to access them. Scanning such a book and putting it online immediately does away with the difficulty of accessing it. 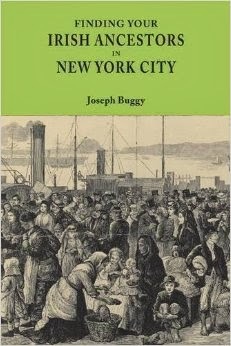 So, if only there was a website that has categorized and linked such books for those doing Irish genealogy in North America? Thanks to Peter J. Clarke from county Down there is. His website, Free Irish Genealogy ebooks, is guaranteed to get your non-genealogical spouse (NGS—not that one!) wondering why you are spending even more time online. The books are categorized broadly by themes, such as pedigrees, family histories, diaspora, resources, and more. Of interest to readers of this blog are the Irish Diaspora – North America, Irish American Family Histories, and Irish Canadian Family Histories sections. So, if you want to find out about topics such as the descendants of Bernard Gormley, an immigrant from Derry who came to New Brunswick; Irish settlers of southern New Hampshire; and the American and Canadian descendants of Thomas O'Shea from Kilkenny, then this is the site for you. There are three more TIARA databases worth pointing out. Of particular interest to those searching for their townland of origin is the members' surname database. Names from Ahaesy to Yore, and everything in between, are featured. The vast majority have an Irish place of origin, where the person with that name emigrated to, and a year of birth for what is presumed to be the earliest known ancestor. You can also contact the member if you think you have an ancestor in common. TIARA members have also transcribed headstone information and created name indexes from three Catholic cemeteries: St. John's, Worcester; Old St. Mary's, Canton; and St. Patrick's and Calvary, Brockton. Lastly, if you have ancestors from Worcester, MA, then this final database will be of interest to you: the Worcester Irish Project. It was compiled by father and son team John and Thomas Canavan and consists of transcriptions from vital, census, and naturalization records concerning people from the city. Irish places of origin are to be found for some people in the database. If you have Massachusetts Irish ancestors then it really is worth being a member of this organization and checking out their website. TIARA, the Irish Ancestral Research Association, is an Irish genealogy group based in the Boston area of Massachusetts (click here to learn more about their meetings). As the largest Irish genealogy group in a traditionally Irish state they have many interesting databases on their website. One such database that they feature is information from the Massachusetts Catholic Order of Foresters. This was a fraternal life insurance organization founded in Boston in 1879 by a group of Irish immigrants. Over the ensuing decades the organization spread throughout the state and by the end of the 19th century there were ninety-five branches throughout Massachusetts. TIARA has created an index for mortuary records from the Foresters. The database contains over 27,000 names of members who died between 1880 and 1935. Many Famine era immigrants would have passed away during those years. This index will make it easier to find the records of relevance to you. The records are at the University of Massachusetts and are supposed to come online on the Familysearch website at an as yet unknown date. Click here to read more about the Foresters organization and this project. Check the next blog post in a few days for more about TIARA databases. TIARA. Tiara Foresters Project. 2011. http://tiara.ie/forest.php: accessed 16 December 2013. 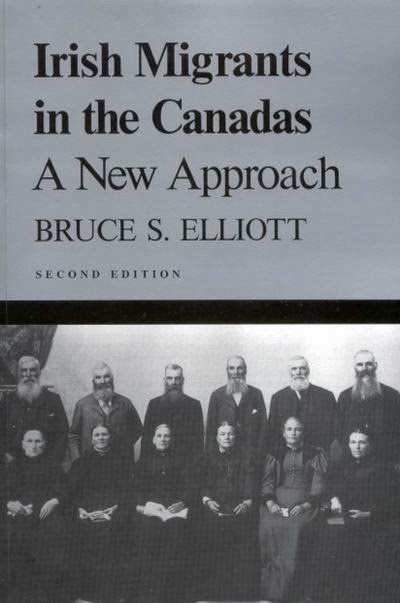 In the forward to Bruce Elliot’s book Irish Migrants in the Canadas: A New Approach, Donald Akenson of Queen’s University, Kingston, Ontario, makes an excellent point: plenty of publications show the statistics of migration from Ireland to North America and plenty of publications focus on individual migrants who made that same journey. But very few focus, in detail, on the migration of communities across the Atlantic. 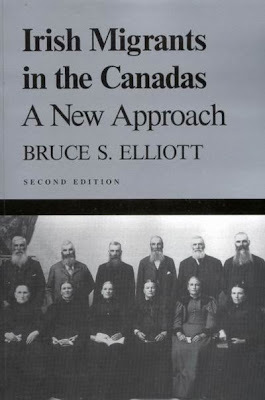 This book begins to addresses this gap in historical and genealogical research with its focus on the migration of 775 Protestant families from the North Tipperary area to Canada from 1818-1855. Forensic in its detail, Irish Migrants in the Canadas gives the reader a vivid understanding of this part of Ireland in the early and mid-19th century, the families that went to Canada, and what happened to them and the next generations as they built their new life. This is the type of publication that every genealogist dreams about coming across in relation to one of their ancestors. Local history on both sides of the Atlantic, detailed maps of settlement, passenger list information, constructed pedigree charts, and lots and lots of citations are all to be found. If you believe you have an ancestor who was a part of this migration then beg, borrow, or steal this book. Last month I came across the My Kerry Ancestors website. Run by Kay Caball, a professional genealogist, it has a great blog all about genealogy in Kerry. One very interesting post concerns a migration of people from north Kerry to Canada. The post focuses on the book The Kerry Chain, The Limerick Link by Carol McCuaig. This book goes into great detail about emigration from north Kerry over the course of the 19th century. You can read the blog post by clicking here. More generally, the blog is a great read if you have ancestors from Kerry. Disclaimer: Kay is a graduate of the Certificate in History of Family and Genealogical Methods course at the Irish Ancestry Research Centre (IARC), University of Limerick (UL). UL is my alma mater and I am a research associate at IARC. The New York State based Troy Irish Genealogy Society has just added two new databases to their website. Re-interments From St. Mary's Cemetery and Styles Funeral Home Records are now available to search. Read more about this at Eastman's Online Genealogy Newsletter. If you live in the Bay Area of California and are looking to conduct Irish genealogical research then the United Irish Cultural Center in San Francisco is a must stop. Since it's opening in 1975, the center has provided members with dining and banquet facilities for social, recreational, athletic, and cultural activities. For genealogists the main facility is the Patrick J. Dowling library. It holds over 3,000 titles on subjects ranging from archaeology and architecture to mythology and folklore. More specifically, the library has a considerable genealogy and history collection. This 2010 listing shows the available genealogy titles and has more than likely been added to since then. There are also considerable journal, newspaper, and microfilm and microfiche collections to consult. The United Irish Cultural Center is located near the San Francicso zoo on the corner of 45th Avenue and Wawona St. You can contact the library at library@irishcentersf.org. A couple of months ago I moved from New York City to the Washington, DC metro area. Just like when I moved to the US, one of the first things I did was find out if there was a local Irish genealogy group. Luckily, I found one at the Washington DC Family History Center. I'm going to my first meeting tomorrow night and am looking forward to learning from others and contributing my knowledge. Whether you have Irish ancestry or not I cannot recommend enough for you to join a genealogy group. Genealogy groups and societies come in all shapes and sizes: ethnic (Irish, Italian, German, etc. ), geographic (New England, New Jersey, Antelope Valley, CA), and national (National Genealogical Society, Genealogical Society of Ireland etc.). There is something for everyone, whether you know all the townlands of origin of all your Irish ancestors or only know they come from Ireland. If you have been researching for years and know your civil parishes from your civil registration districts then it is a chance to help others with their research. If you are just starting out, you can avail of the expert knowledge of others and avoid the pitfalls of genealogy research. Many groups also offer workshops, expert talks, visits to libraries and archives, and have excellent newsletters. So where can you find Irish genealogy groups in the US and Canada? Well, you can start with the 'Groups and Societies' section of this site, where you will find all the groups that I am currently aware of. If you live too far to go to meetings a membership can still be worth it for the emails, newsletters, and other communications that are sent out. More broadly, the Federation of Genealogy Societies maintains an extensive database of U.S and Canadian groups on their website. So, if you are still looking for a new year's resolution, join a genealogy group! I'd like to wish a happy new year to all the readers of this blog! Having just turned 4 months old, Townland of Origin is still relatively young but I have been delighted with how many people are checking in. There has been an average of over 2,000 page views per month in that short time. People on Twitter have also been very kind to retweet links to articles. My main development for 2014 will be the publication of my first book, Finding Your Irish Ancestors in New York City. It is the product of three years of research in NYC. There is currently no such guide out there and I hope it will help people find their townland of origin. It will be published by the kind folks at Genealogical Publishing Company in Baltimore. Joe Garonzik and his team have been working hard over the last few months to get it ready for its February release date. It will be available from their website genealogical.com. Stay tuned to find out the exact date it goes on sale. Just before Christmas I was delighted to agree a partnership with the genealogy magazine, Irish Lives Remembered. Throughout 2014, I will write a monthly article about doing genealogical research in the U.S. Naturally, there will be an Irish focus to these articles. The blog will continue and I also plan to incorporate more material into a Townland of Origin website. Recently, I've added a 'Videos & Articles' section. This will grow over the coming months. One interesting piece will be about the townland of origin of a rumored 2016 Presidential candidate. Hillary Clinton? Martin O'Malley? Ted Cruz (Wexfordians were in Texas in the 1830s, after all!)? All shall be revealed in due course. All in all, 2014 is shaping up to be a good year and I look forward to continuing to help you find your townland of origin.